The blue river in the crest represents the River Feale from which the club takes its name. 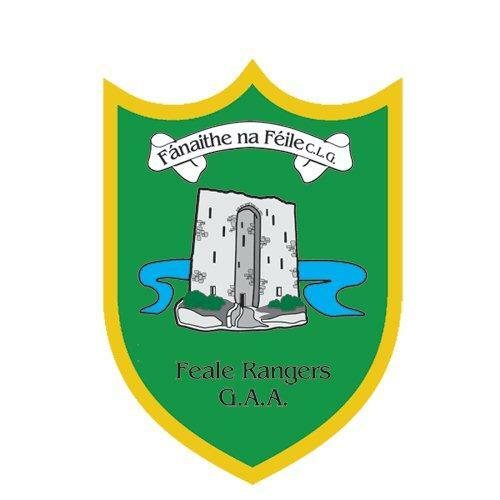 The Feale which rambles through the countryside of North Kerry intersects much of the land where the various clubs which band together to form the Feale Rangers team reside. Listowel castle which lies in the center of North Kerry in Listowel town forms the centrepiece of the Feale Rangers crest. This tower of rock hughly reflects the rock of strenght that forms the spirit of each and every Feale Rangers team. 'FÃ¡naithe na FÃ©ile G.L.G.' and 'Feale Rangers G.A.A.' inscriptions finish off the crest and proclaim the name of Rangers for all to see. The Feale Rangers are mentioned for the first time in the annals of the county championship back in 1956 when representing all of North Kerry, following the joining of the two North Kerry teams, namely North Kerry and Shannon Rangers. This new team of Feale Rangers, contested the Co. finals of 1959 and 1962, -- defeat being their lot on each occasions following replays, and following defeat to John Mitchell's in semi final of '63, North Kerry once again reverted to two teams, namely St. Vincent's and Shannon Rangers. While Shannon Rangers became county champions in 1964, won again in '72 and lost the finals of 1971 and 1974, St. Vincent's struggled to make any impact in the championship and in 1971 they were renamed Feale Rangers, this grouping being the fore runner of today's team. Success was slow in coming and it was not until 1977 that the final pieces of the jigsaw fell into place as the late Andy Molyneaux and John O'Flaherty set in train a golden period for Feale Rangers. Between 1977 and 1985, Feale Rangers contested six senior finals, winning two, and won two minor finals as well. Though they contested and lost the '77 final to neighbours Shannon Rangers, the breakthrough arrived the following year 1978, when the Feale Rangers won their first senior title, defeating Mid Kerry, 0 - 8 to 0 - 3, thus ending the drought of 89 years. Although many great footballers came from this particular part of North Kerry, Johnny Wren and his team-mates became the exclusive bunch of men to capture that first title. Tim Kennelly was in devestating form at centre half-back and Ger Leahy outstanding at full-back, at midfield Johnny Mulvihill was an absolute glutton for work and if his shooting matched his remarkable courage the gap would have been much wider at the finish. Selector Eric Browne said of him afterwards: 'It isn't a heart that man has at all, but a machine'. All due praise to trainer John Flaherty for the marvellous job with the team. This was an historic achievement and the winning panel was as follows; John Kennelly, Paddy Hannon, Gerald Leahy, Johnny Wrenn (Captain), Sean Walsh, Tim Kennelly, Eamonn FitzMaurice, Jimmy Deenihan, Johnny Mulvihill, Robert Bunyan, Johnny Bunyan, Tommy Bridgeman, Pat Flaherty, Paddy Mulvihill, Gerald O'Sullivan, Patsy O'Connell Seamus O'Donovan, Timmy O'Sullivan, Mike McGuire, Mike Mulvihill, and Mick O'Brien. The selectors were ; Ciaran Rohan, Patrick Kelly, Eric Browne, Pat Joe McEnery, Dan McAuliffe and John O Flaherty who trained this team as well as training the victorious Feale Rangers minor team, - an unique achievement. Just two years later Feale Rangers also won the senior championship in 1980 when they defeated Austin Stack's 1-10 to 1-7. Feale Rangers took the title because of a greater all-round cohesion, tremendous power and flair down the middlw and above all else, because they refused to bow the knee in the face of the tremendous pummelling they had to withstand, especially in the opening thirty minutes. For Stacks full-forward Mickey Sheehy was having a mighty tough time of it trying to escape from the undivided attentions of full-back Jimmy Deenihan. In the second half the Austin Stacks wizard was moved to the 40 but he was promptly followed by Deenihan . The move proved to be the correct one for Rangers as Sheehy was seldom given the kind of scope and space in which he liked to manoeuvre. With Sheehy being held much of the sting was taken out of the Stacks attack. Rangers fought back from being 1-4 to 0-1 in arrears to take complete control of the exchanges for the remainder of the half, thanks in large measures to the magnificence of Johnny Mulvihill, who came into his own at midfield. John Kennelly, Paddy Hannon, Jimmy Deenihan, Nicholas Riordan, Johnny Wrenn, Tim Kennelly Mike Wrenn, Sean Walsh, Johnny Mulvihill, Gerald O'Sullivan, Tommy Bridgeman, Tom O'Connell (Capt. ), Robert Bunyan, Donal Mulvihill, Patsy O'Connell, John Keane, Colombo O'Connor, Jodie Fitzmaurice, Mike McGuire, John Sheehy, Pa Foley, Eamonn Sweeney, Mike Joe Thornton, Ger. Leahy, Mike Mulvihill and Andy McCallum. Con Riordan was trainer. Sadly this was Feale Rangers last success in the senior championship until 2007, even though they contested the County finals of 1982, '83, '85 and again in 1999. John Somers, Thomas Dillon, Eamon FitzMaurice, Jerome Stack, Liam Keane, Stephen Stack, Eamon Breen ( Captain), Maurice Kearney, BreandÃ¡n Whelan, Enda Galvin, Noel Kennelly, Tadgh Kennelly, Paul Galvin, Alan Doran, Brian Scanlon, Jack Corridan, Mossie Mulvihill, Padraic Somers, John Mulvihill, Gary Stack, Derek Galvin, Billy McElligott, Marcus Kelliher and Jackie Mulvihill. Johnny Horgan was trainer with selectors Jimmy Deenihan, Johnny Stack, Tom Fitzgerald and Liam Dennehy.